Since its launch in October 2016, our WooCommerce product display plugin has quickly become our bestselling WordPress plugin. It displays products in a sortable table view. Today we’ve launched a new version of the product display plugin which supports product attributes and variable products. More customers have requested support for attributes and variations than any other feature, so we’ve made this a priority. It comes hot on the heels of other improvements to our WooCommerce table plugin. Previously, you could display most product data such as title, description, price and featured image in the table, but not attributes. You can now include each attribute as a separate column in the product table. We understand that all WooCommerce websites use product attributes in different ways. To make it applicable to everyone, you can list exactly which attributes are displayed in each product table. This means that you can display some attributes but not others. If you have multiple product tables on your WooCommerce website then each one can list different attributes. For example, you might have an e-commerce clothes website with one product table for men’s shirts and another for women’s dresses. The table for men’s clothes can include a ‘Collar Size’ column and the women’s product table can have a column for ‘Dress Size’. See it in action on the new product attributes page on the plugin demo. We’ve thought long and hard about the best way to present variable products in the table. Very few WordPress product display plugins support variations, and we don’t think any of them get it right. For example, we saw one plugin that displays each variation as a separate row in the table. This would have been easier for us to develop (!) but I think it’s the lazy option. It takes up a huge amount of space and isn’t a neat solution. Some WooCommerce stores have dozens of variations, so it’s important to display each product within a single row of the table. The new version of our WooCommerce product display plugin can list each variation as a dropdown list alongside the ‘Add to ‘Cart’ button. Customers can select their variations, select the quantity and add to cart cart straight from the product table. When you select a variation, the actual price for that variation appear under the Add to Cart button. If you’re managing stock for each variation then the stock status or stock level will appear too. If you have more variations than can fit in a table then you don’t have to enable the variations option. By leaving it disabled, the ‘Add to Cart’ button for variable products will change to ‘Select options’. Customers can click through to choose their variations and buy from the single product page. You can see this in action on the variations page on the demo site for the WooCommerce product display plugin. Note: Since this article was published, we have also added support for Product Add-Ons. 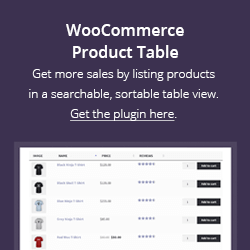 This lets you add even more product options in your WooCommerce tables. If your WooCommerce store has many products then you can help customers find what they want by letting them filter by attribute or variation. 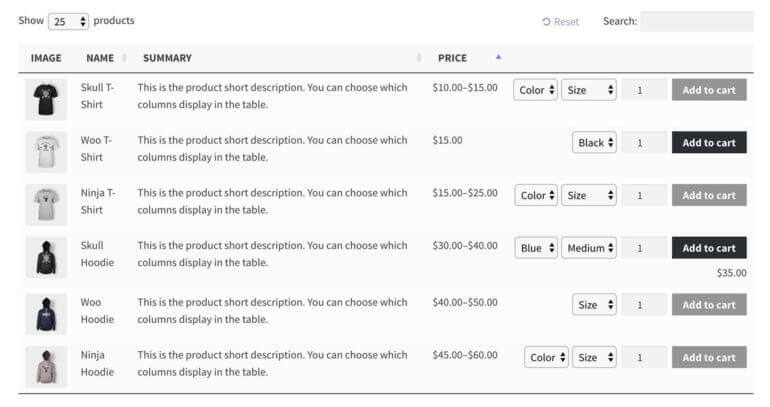 The new version of WooCommerce Product Table lets you display filters above the table with dropdowns for attributes, variations, categories or tags. Adding filters=”true” to the product table shortcode will display all possible filter dropdowns above the table. Alternatively, you can choose which filters appear. For example you may want the product table to include filters for the size attribute but not color. You can see this in action on the new product attributes page on the product display plugin demo. These new features are perfect for many different types of WooCommerce product displays. You might have a WooCommerce order form and want to include attributes or variations. Maybe you’re a restaurant using it for an online food ordering system. You might be using product tables with our Password Protected Categories plugin to create a WooCommerce wholesale store. Do you want to list WooCommerce products in a simple layout? Maybe you want to create a WooCommerce product directory with extra product data. Whatever you need WooCommerce product tables for, these new features will help the plugin to display products in whichever way you need. If you like it, join our WordPress plugins affiliate scheme and each 30% commission for recommending our WooCommerce product display plugin! Attributes & variations not enough? If you want to display even more product data in your WooCommerce tables, you can also show custom fields and taxonomies. Check out our tutorial on how to Display Extra WooCommerce Product Data with Custom Fields & Taxonomies. We’ll be contacting everyone individually who has requested support for product attributes and variations. To get WooCommerce Product Table for your own website, simply buy the plugin and start setting it up. Your new way of displaying products could be ready within a few minutes! You can also sign up as affiliate and get 30% commission for recommending the table plugin!